This is one of my favourite pictures that I took at New York Central Park. The person that you can see to the left there is playing an instrument called the Erhu - an instrument that can sound like the definition of sadness and loneliness. You could also say that this instrument is very good of creating a 'longing' music I find - and of course, one could also play happy music with it. Now, this guy played this very longing music that just goes right inside and makes you stop for a moment to appreciate it. 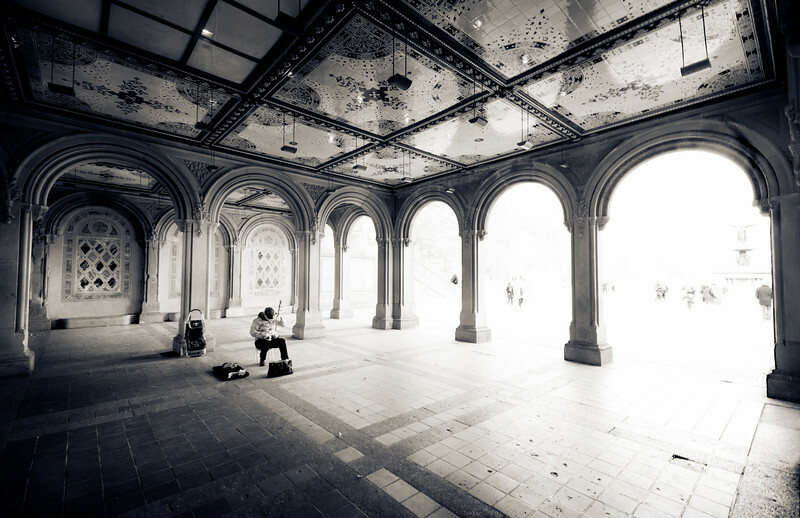 He was sitting just beneath the Bethesda Terrace in Central Park, which is actually super impressive due to its golden style ceiling and pillar structures. However, while outside of the area itself there were dozens of people, few passed by and even fewer took a second to stop by and listen. Here is the thing - I am sure that the musician gets enough tourists passing by and that such musicians are on so so many corners in any major city - but it makes me think sometimes how difficult it has become to stop somewhere and appreciate beauty (especially in a set up like this!). We got used to it. I get the same feeling sometimes when I am walking around in Dublin, Ireland, where we have so many great street musicians. But only certain ones get attention, usually bands or singers, but people like the musician in this image are often passed by. Well, I am glad I found him there and took a moment to listen to him after shooting this image. The performance went on for about 7 min - he then received a call and went away.